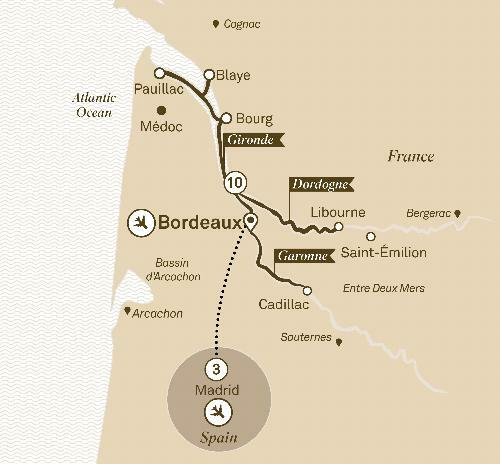 From sublime Bordeaux, with its traditional culinary arts and renowned red wines, to lively Madrid, western Europe’s architectural mecca, this is an itinerary that combines the sensuality of rural France with the exuberance of urban Spain. Experience two vastly different aspects of Europe as you journey from the fishing villages of Arcachon Bay to the sophisticated eateries of central Madrid. You’ll find no shortage of variety or surprise on your wonderful sojourn in the west, where you’ll be travelling through picture perfect French villages one day, and marvelling at Madrid’s Prado Museum or Royal Palace the next. If you’re looking for an experience that balances the delightful with the exotic, this may well be the itinerary for you.